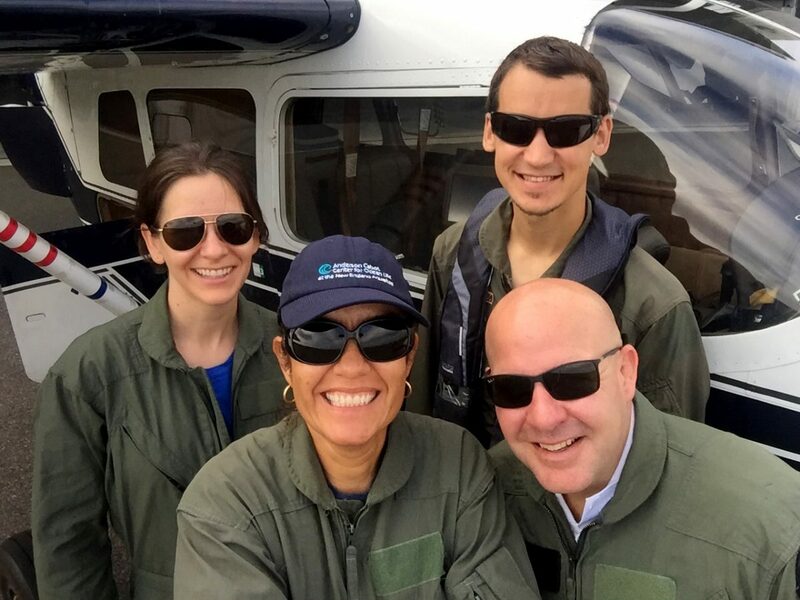 “Wow wow!” These simple words capture our excitement throughout the second aerial survey of the year at the Northeast Canyons and Seamounts Marine National Monument. 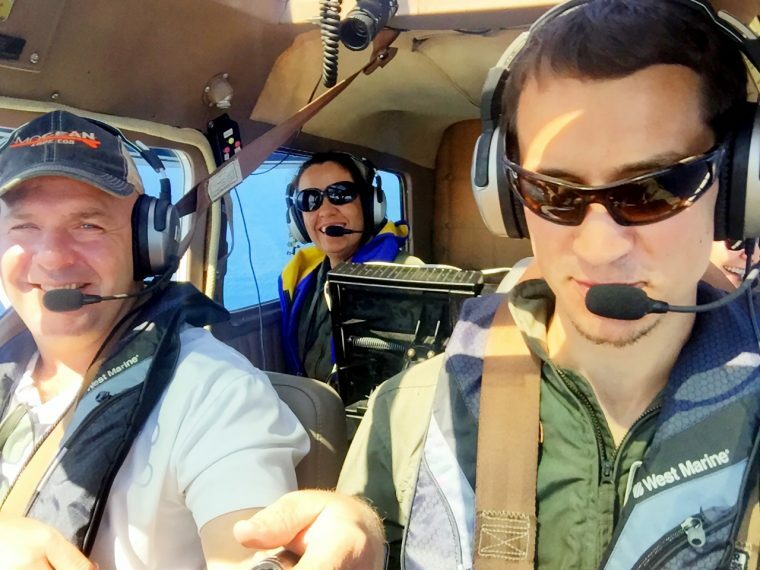 On September 6, Marianna Hagbloom and I, with the help of two experienced pilots from Avwatch, traveled to the monument to continue our research on the diversity and abundance of megafauna in this important protected area. This important work is made possible thanks to the generous support of the National Ocean Protection Coalition, Natural Resources Defense Council, and Conservation Law Foundation. 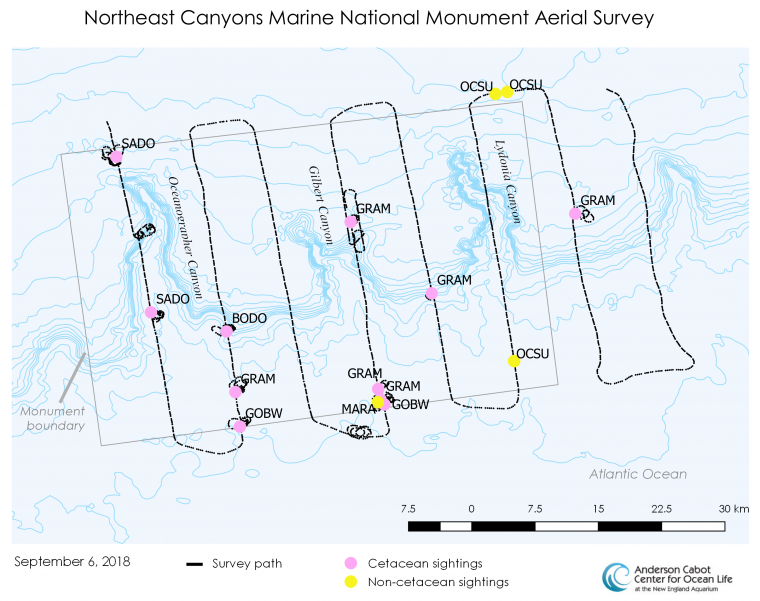 Marine mammal (pink dots) and other marine animal (yellow dots) sightings recorded during an aerial survey conducted September 6, 2018. Track lines (black dots) are designed to cover the monument area evenly. Species are marked by four-letter descriptors. BODO = bottlenose dolphin (Tursiops truncatus), GRAM = Risso’s dolphin (Grampus griseus), SADO = common dolphin (Delphinus delphis), GOBW = Cuvier’s beaked whale (Ziphius cavirostris), MARA = giant manta ray (Manta birostris), OCSU = ocean sunfish (Mola mola). 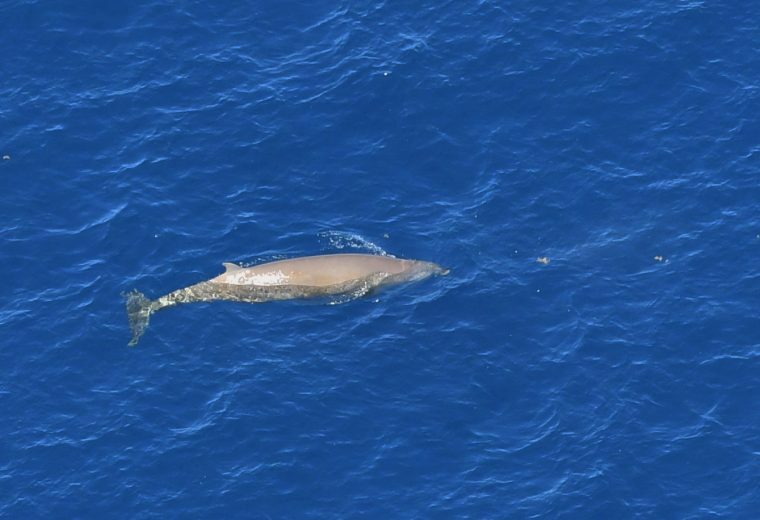 Much like our previous aerial surveys, this trip’s sightings did not disappoint. In less than four hours, we saw more than 600 animals. That’s the equivalent of about three animals per minute, an amazing count in such a short period of time and the highest count so far! The marine monument is known as the “Serengeti of the Sea” for a reason. We left the office about 7:15 a.m. and drove to Plymouth, where the Cessna Skymaster used for the aerial surveys is located. The team took off at 9:33 a.m. and arrived at the monument an hour later. 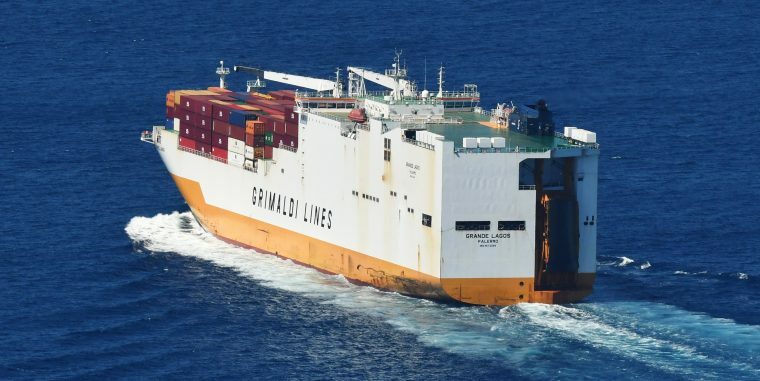 As usual, at the start of every track line, the environmental conditions were recorded, but the task had to be interrupted immediately because a group of about 25 common dolphins was spotted on the starboard side of the plane. As the plane started to steer to the right to take photograph of the group, we spotted a superpod of dolphins on the port side. 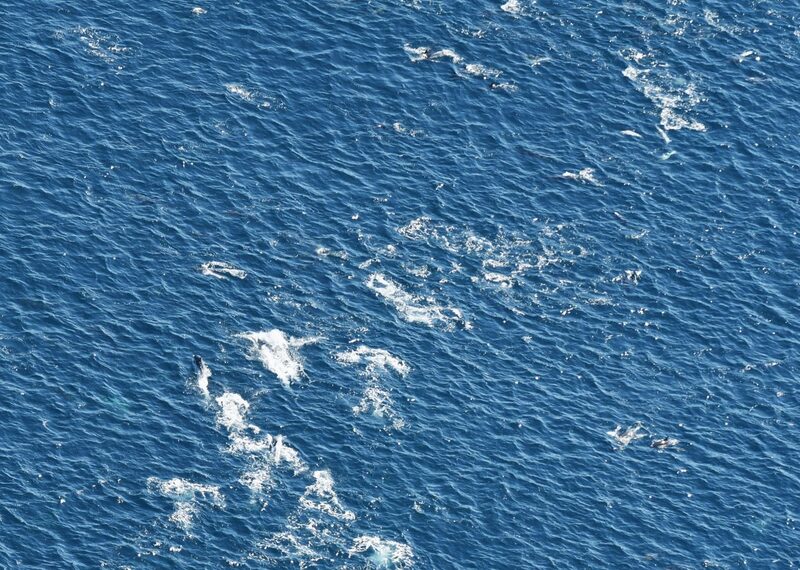 The team was in awe to see that approximately 250 common dolphins were actively swimming at the surface. It took us several minutes to get a good estimate of the group size because it was widely spread and included smaller subgroups such as the one sighted at the beginning of the survey. Little did we know that this first large group of dolphins was a good omen for the rest of the day. In total, we spotted 335 common dolphins, 234 Risso’s dolphins, 30 bottlenose dolphins, two Cuvier’s beaked whales, three ocean sunfish, and a rare giant manta ray. 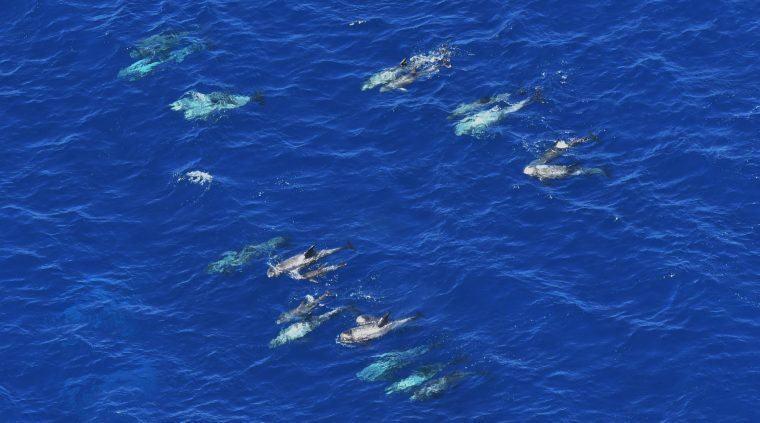 While not as big as the superpod of common dolphins, Risso’s dolphins were seen in large groups varying between 60 to 80 animals, although two sightings included groups of four and 10 individuals. The spatial structure of the pods of Risso’s dolphins was also different than that of common dolphins. 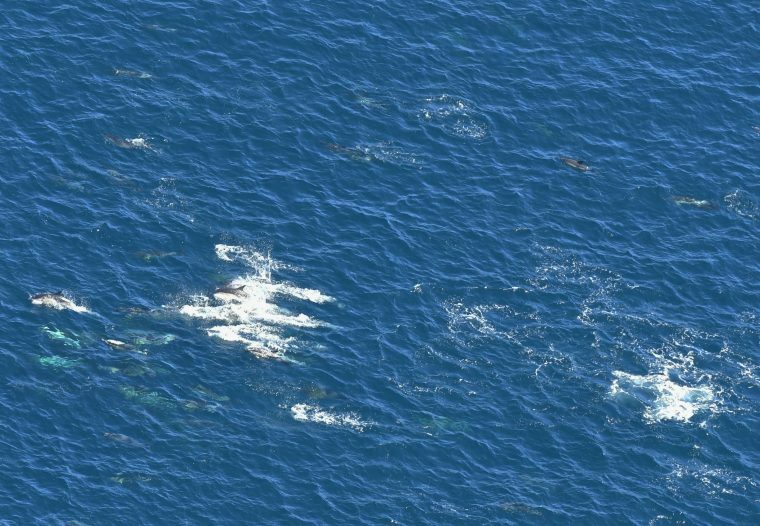 The Risso’s groups were more cohesive and animals traveled in a formation next to each other whereas the common dolphins were further apart within their groups. Similar to the summer and fall 2017 surveys, all dolphin groups sighted this survey included many calves and juveniles, further suggesting that the monument is a nursery area for several species. Fishing gear seen on the Monument boundary. 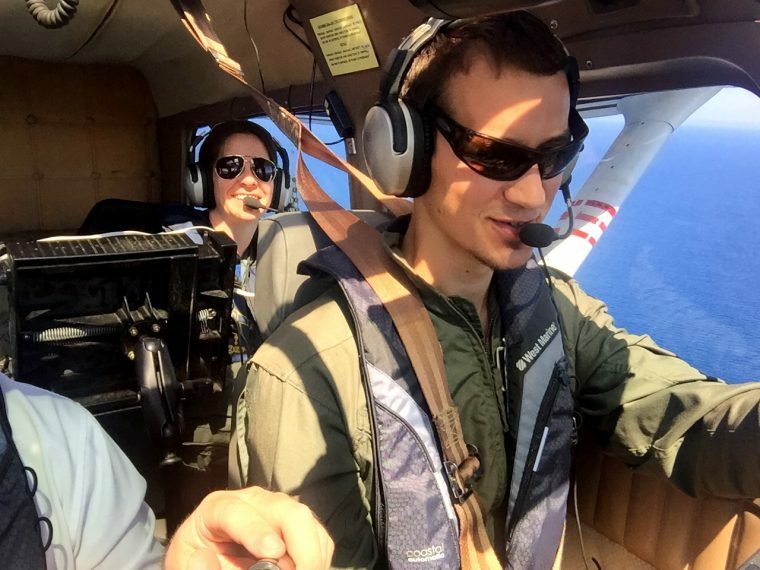 A shot of the aerial survey team inside the plane. 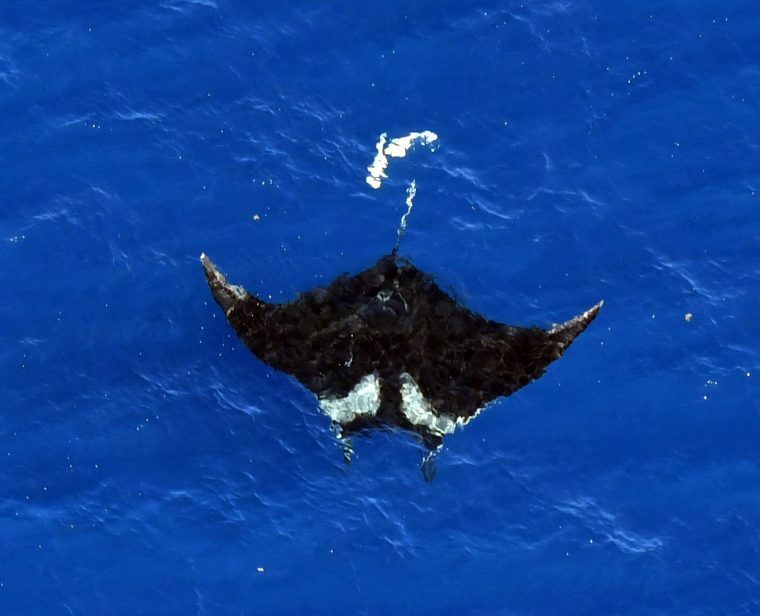 The sighting of a giant manta ray was unexpected, as this area is at the extreme northern edge of its documented range. 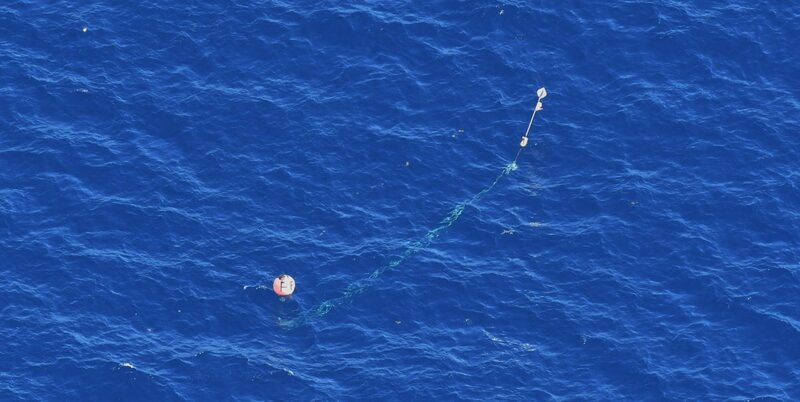 As we continue to study the monument, one obvious pattern has emerged—fishing gear is more common near both borders. 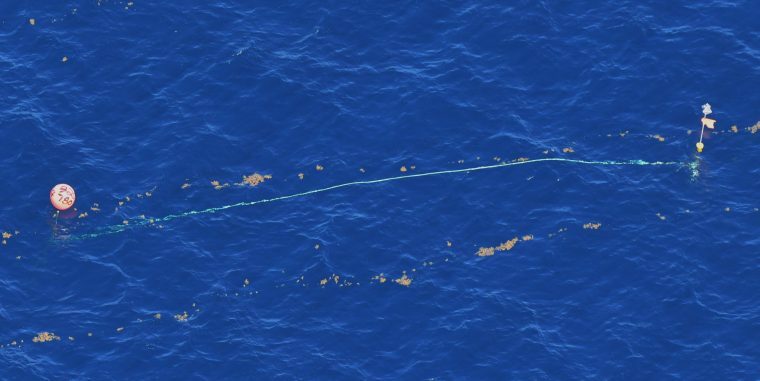 Out of the 21 pieces of fishing gear sighted in this survey, 85 percent was found in the first (48 percent) and last (38 percent) track lines of the survey. We also spotted a cargo ship inside the monument. Fishing gear is common along the monument’s edge. The team also spotted a cargo ship steaming within the monument boundary. The monument celebrates its two-year anniversary on September 15, and every survey we do reinforces the uniqueness and importance of this region. The monument is a biodiversity hotspot where rare and endangered whales, dolphins, and countless other fish and invertebrates occur in large numbers, and interact with one another and their ecosystem with minimal human disturbance. This area was declared protected because it is extraordinarily special, and it’s important to keep it that way. This was the fourth in a series of aerial surveys of the monument that began in summer 2017. Read more about our aerial surveys. Help us protect the Northeast Canyons and Seamounts National Monument—the blue park in our backyard.